Quickly and easily transform classroom review sessions into an interactive quiz-off, with no tangled wires wrapping around the room! Two ways to play! Students race to press their buzzers in "Quiz Show" mode, or Wireless Eggspert chooses a student at random in "Scrambled Eggs" mode. Engages students by making review sessions and quizzes fun and interactive! Includes Wireless Eggspert, 6 wireless student buttons, wireless teacher remote, and guide. Additional student buttons sold separately. Unit requires 4 AA batteries; student buttons require 2 AAA batteries each; wireless teacher remote requires 3 AAA batteries. No batteries included. 2 ways to play - "Quiz Show" and "Wheel of Fortune"
Six colorful eggs light up, flash, buzz, beep, and talk! Wireless Eggspert;Best-selling Wireless Eggspert is faster than ever before!The flashing, beeping, buzzing, anywhere, anytime game system now features 2.4GHz for the most reliable transmissions. 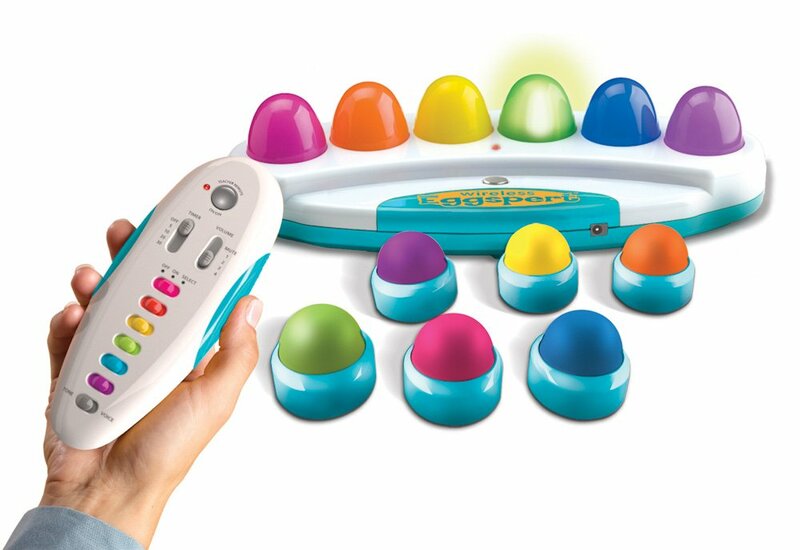 Grades 1+/Ages 6+;EI-7881 WirelessEggspert $99.99;The nitty-gritty; Includes Wireless Eggspert, six wirelessstudent buttons, wireless teacher remote, and guide; 2.4 GHz for the fastest,most reliable transmissions; Two ways to play-Quiz Show and Scrambled Eggs;Wireless Eggspert 2.4 GHz requires 4 AA batteries (not included); Wirelessstudent buttons require 2 AAA batteries (not included); Wireless teacherremote requires 3 AAA batteries (not included); 2.4 GHz unit is onlycompatible with new 2.4 GHz pods From the Manufacturer Energize class review and add pizzazz to daily activities with WirelessEggspert, the flashing, beeping, buzzing, interactive game system that can beused anywhere in the classroom. Eggspert's two fun game modes--Quiz Show andWheel of Fortune--spice up math facts drills, spelling bees, and quiz games onany subject. Using the wireless Teacher Remote, the instructor can setEggspert's lights in motion, choose players, select fun sound effects, andeven adjust response times--whether at her desk or anywhere in the classroom.Because student response buttons are wireless too, students can buzz in fromtheir desks--even at the back of the class. Includes wireless Eggspert, 6wireless student buttons, wireless teacher remote, and guide. Requires AA andAAA batteries (not included). Wireless Eggspert unit also works with an ACadapter (sold separately).